The first set of performance testing numbers for the upcoming Subaru BRZ sports coupe have hit the internet and the 200 horsepower rear wheel drive coupe has turned in some balmy numbers – with a 0-60 time in the 7 second range and a quarter mile time that is likely to make many drag racing fans shake their heads. Before we get into the performance numbers recently posted by Edmund’s Inside Line, we want to point out that the Subaru BRZ (along with the Toyota GT86 and the Scion FR-S) was not designed or engineered to be a drag car. With a perfect weight distribution ratio, a low center of gravity and a lightweight chassis, the BRZ was designed to carve through the corners – not tear up the drag strip. However, many buyers look at these performance numbers when considering a car but hopefully for Subaru and Scion – buyers focus more on how well the car drivers than the bare bones performance figures. The Subaru BRZ sports coupe, fitted with the 2.0L Boxer engine that puts out 200 horsepower and 151lb-ft of torque sends the power to the rear wheels via a 6-speed manual transmission. From a dead stop, the BRZ was able to hit 60 miles per hour in a balmy 7.3 seconds – 3 tenths of a second slower than the Nissan Leaf. Edmund’s Inside Lin reported that this slow 0-60 time was due in part to the fact that the rev limited did not allow them to stay in second gear through the end of their 60mph run, shifting around 59mph and slowing the run down considerably. We suspect that if you could tune that rev limiter out, the 0-60 time would be reduced well into the mid 6-second range. 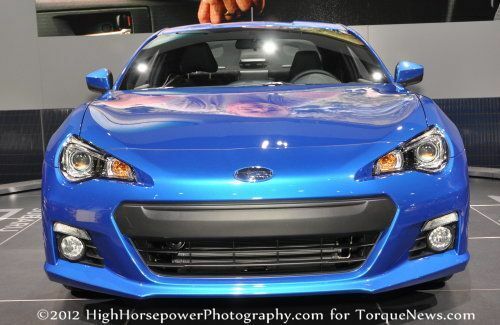 Things weren’t much better in the full quarter mile with the Subaru BRZ running a 15.3 @ 92.1 miles per hour. For comparison, the 2013 Hyundai Genesis Coupe with the 2.0L turbocharged 4-cylinder ran the standing quarter mile at a much (much much) quicker 13.9 seconds while also dashing to 60 in just 5.3 seconds. The entry level Genesis 2.0T Coupe is arguably the closest competition for the new BRZ and based on these numbers, the Genesis is clearly the much quicker vehicle. When you get into the turns, things should be a different story for the Subaru BRZ coupe compared to the Hyundai Genesis Coupe. Inside Line found that on the slalom test, the BRZ turned in a respectable 69.1 miles per hour while hitting 0.92g in the lateral skid pad test. The BRZ beat the Genesis in both categories as the Korean turbocharged sports car could only hit 67.4mph in the slalom with a skid pad figure of 0.89g. Far more impressively, the BRZ’s slalom and skid pad numbers were better than those turned in by the 2011 Ford Mustang GT during Inside Line’s testing (Mustang = 67.3mph, 0.91g). The key area where the new Subaru BRZ coupe could struggle in the comparison by a prospective consumer looking at the new Subbie and the Hyundai Genesis 2.0T Coupe is the price. The Gen Coupe starts at just $24,250 and while the pricing has not been announced for the BRZ – the Scion FR-S (the same car, different badges) is set to carry a starting price of $24,200 and the Subaru version should cost at least $1,000 or so more, considering that the BRZ comes with a pricey, advanced navigation/infotainment system. With a price expected to start around $26,000 and performance numbers that fall short of the Genesis Coupe in many categories – it could be a tough road for the Subaru BRZ unless the Subbie gets a turbo of its own. The times that you have for the Genesis Coupe are the for 3.8L engine, as taken by Car and Driver, Motortrend, and Edmunds, not the 2.0T which has a 0-60 of 6.9. Please check your facts before publishing them to the public. Bit skeptical of the Inside Line times, as Motor Trend reports 0-60 in 6.4 and 1./4 mile in 14.9 at 95+ mph. In either case, this car is not about straight line speed. It's performance target was the Porsche Cayman, widely acclaimed as the best handing production car around, and they've produced a car delivering 95% of Cayman performance for 50% of the cost, no easy trick. No. - 14.9s is time for old 2.0l 225 hp genesis, new genesis is much quicker, low 14s for 2.0l and mid 13s for v6. Genesis has very narrow front tires for its weight,225....other sport cars of its weight have 245 or 255 on front. With apropriate sized tires, genesis handling secs will be as good as brz. Reviews mentioned that genesis handling undermined by pos tires. Brz will be greate car if you plan to race it on the track often, it will be a boaring daily driver, no more enjoible then civic. Are you sure on the 0-60 times on the hyundai genesis coup 2.0? Everywhere I read puts the v6 at 5.5 to 5.8 seconds to 60.